You should know how blockchain works and what to do when a client wants to use cryptocurrency to buy or sell property. It’s time to prepare for the future of real estate. Blockchain technology and cryptocurrency are two parts of the same system: a cryptosystem. Blockchain is a secure series of ledgers that securely hold a record of cryptocurrency transactions. It tracks all transactions and digital assets and the record is shared among all verified users, to help reduce the opportunity for fraudulent or corrupt activity. To read a more detailed explanation about blockchain in relation to land titles, check out the Cook County Recorder of Deeds website definition. Blockchain can be used for storing all types of real estate documents, such as titles, deeds and surveys. Blockchain technology can eliminate the need for title insurance in the future, due to the transparency of the transaction and secure data storage of the title and other documents of ownership. This not only speeds up the buying and selling process, but also allows for greater confidence in the purchase from clients. In addition, blockchain can eliminate the notoriously fragmented and restricted information on the Multiple Listing Service (MLS). In its place, a secure and shared nationwide database would have real-time property information, eliminating doubt and reducing turnaround times for the buying and selling process. In essence, the ability of a party to forge a signature and commit property fraud through email or mail would become a thing of the past. 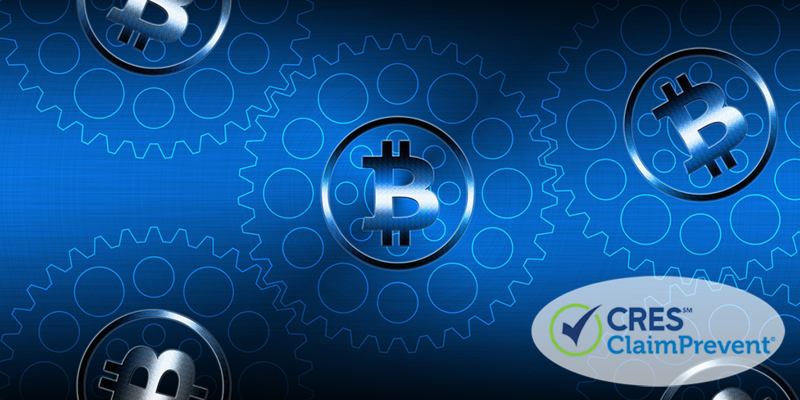 Cryptocurrency is a digital currency that is encrypted using cryptography, but it’s not backed by a third party such as a bank. It’s bought and sold in a similar manner to stocks on the stock market, and offers a new way to purchase real estate. Americanexpress.com reports that over 700 cryptocurrencies are currently being traded. The most prevalent form of cryptocurrency is Bitcoin. Bitcoin is also the term for the distributed ledger which records the Bitcoin token transactions. Bitcoin was the first blockchain in existence. Cryptocurrency can be easily converted to US dollars by means of a global cryptocurrency payment service provider. It’s an app that allows cryptocurrency users to convert funds and send the funds directly to their bank as US dollars or to pay others in a similar way to PayPal. What is a one-party cryptocurrency transaction? When you have one party wanting to purchase a property with cryptocurrency, the funds will first need to be converted into US dollars. Once the funds are converted, the transaction can proceed as it traditionally does today. What if two-parties want to use cryptocurrency? This is still a rare occurrence. To date, only a handful of real estate transactions have taken place with only Bitcoin in the United States. If you have two people using cryptocurrency in a real estate transaction, you need their agreement that the method of payment is cryptocurrency. The transfer of funds can take as little as ten minutes via an app. Commissions to real estate agents would be paid either via cryptocurrency (if the agent also has cryptocurrency and wants to be paid in this way) or by converting the funds to dollars and proceeding with traditional payment methods. What is the title and escrow process for cryptocurrency real estate transactions? If the funds have first been converted from cryptocurrency to dollars, the process is handled the same as it is today. When both the buyer and seller are using cryptocurrency, the title exchange is possible through blockchain technology. Escrow, however, can present challenges requiring setup with a payment processor to convert funds to dollars. Regulations for this process are not well established at the present time. Traditional documenting of all agreements, communication and elements of the transaction are essential for a real estate agent to protect yourself in the event of a real estate lawsuit. Are mortgage lenders able to lend money to buyers through cryptocurrency? Right now, mortgage lenders are not part of the cryptocurrency market. If buyers want or need a mortgage to purchase a property, they’ll need to convert their money to dollars and follow current practices in securing financing from a lender. Are taxes, which are collected on real estate sales, processed through cryptocurrency? In the United States, cryptocurrency real estate transactions are viewed the same as traditional property sales and are subject to capital gains taxes. Cryptocurrency transactions are not reversible. The transaction can be processed within minutes and once it’s done, the sender cannot pull or retract the funds. Additionally, the cryptocurrency market is highly volatile, meaning that the value of a coin can fluctuate wildly. There is a possibility these fluctuations may cause dramatic changes in value, particularly at the point of conversion — where one party needs to convert cryptocurrency to dollars. Buyer’s agents should ensure your clients understand the risks, because it’s possible that buyers may need to pay more at settlement. Likewise, seller’s agents need to inform their clients that the reverse could occur — sellers could end up with less money than they agreed to, due to fluctuations in the cryptocurrency market. Since blockchain and cryptocurrency are in the early stages for the real estate market, it can’t cater for the complexities of mortgages or tax payoffs. And, both parties still need to pay transfer taxes, recordation costs, and title insurance with real dollars. As an agent, you need to know how to document these details in the written offer and sales documentation to ensure there are no misunderstandings. You want to avoid an unhappy buyer who disputes additional fees not outlined clearly in the contract. While we are likely several years away from the widespread utilization of blockchain technology, real estate agents need to stay abreast of how it will eventually be used to list properties, transact payments, and transact documents and property deeds. For an added layer of protection and peace of mind in this changing real estate market, consult with CRES Insurance Services. With your CRES Real Estate E&O + ClaimPrevent™ policy, you can get advice from a local expert real estate attorney 7 days a week. Contact us at 800-880-2747 to arrange a quote or to review your insurance. Have you facilitated a transaction that utilized cryptocurrency? What challenges or advantages did you experience in the process? Tell us in the comments below.